The stakes are high in special teams play. A routine sequence can go very well ‒ or very poorly. As Chuck Zodda shows us, even the little things can make all the difference between a kick getting away safely and having it blocked. There are some in the NFL who believe success requires extreme trickery and misdirection. They spend hours cooking up exotic schemes to outwit their opponents and pile fakes upon deception until their own team gets confused. However, it is often elegant simplicity in play design that proves most effective. 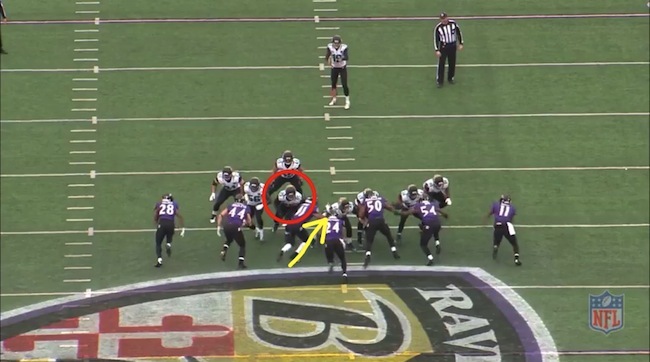 On the other side of the ball, the Baltimore Ravens align with seven men near the line of scrimmage. 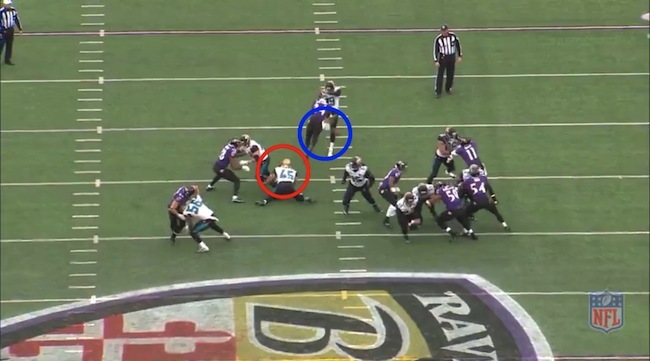 As indicated by the red blocking lines, there is one Jaguar lineman for each Raven. 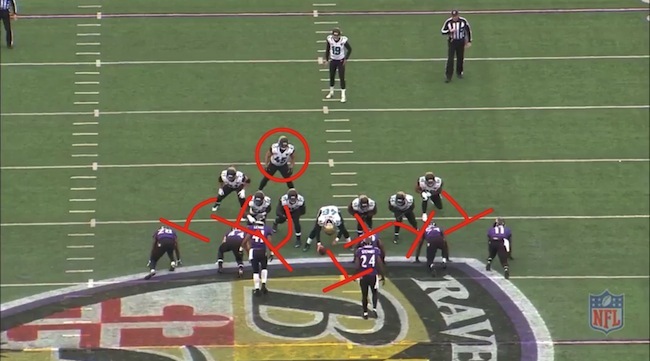 But Jacksonville also has an extra man in the formation in personal protector Will Ta’ufo’ou (#45, circled in red). Ta’ufo’ou’s primary responsibilities are to count the men on his punt unit, call the snap count, and then assist with blocking up the middle. He is a free man assigned to pick up high-risk traffic. At the snap, Anthony Levine (#41) crashes down towards the long snapper, Carson Tinker (#46). More important than occupying Tinker is to cross the face of the right guard, Nic Jacobs (#85), and try to draw his attention. This will allow Darian Stewart (#24) to peel around the backside gap, opening a path to punter Bryan Anger (#19). Punt block schemes are often simply designed to avoid confusion in a critical area. Most teams employ a zone-blocking scheme; if no one comes into a lineman’s zone, he flows to wherever help is needed ‒ but the most important responsibility remains clearing his zone of oncoming rushers. In this case, Tinker and Jacobs should simply continue to react to what is coming into their zone, rather than attempting to cross and block a specific man. Tinker should pick up Levine coming through at an angle, with the guard blocking Stewart as he comes late. Indicated by the yellow arrow, Levine crashes down on Tinker at the snap who, for some reason, is looking to his left ‒ where there is no one that he is responsible for blocking. More importantly, there is no one there to actually block. But most worrisome is that Jacobs is also looking in this direction, following Levine as he heads towards Tinker. Stewart is still two yards behind the line of scrimmage at this point. Indicated by the red blocking line, Jacobs now has his back to the sideline and is fully engaged on Levine. He doesn’t even see Stewart starting to fill the hole he has left in the line. Stewart is now even with the line of scrimmage, with only Ta’ufo’ou between him and the punter. But Ta’ufo’ou is caught looking in at Levine as well. Circled in red, his head is clearly focused on the pressure in the middle. He pays no attention to Stewart coming through the gap. Circled in blue, Stewart blocks the punt with his body. The breakdown on the Jaguars’ line is so complete that Stewart is barely touched on his way to Anger. His route is little more than a furious 15-yard sprint culminating in the emphatic thud of ball against pads. With some blocks, it is easy to point to great athleticism or a phenomenal effort as the primary reason for the block. On this one, Stewart simply ran through a wide-open door unabated. Ta’ufo’ou (circled in red) can only watch as the disaster unfolds. 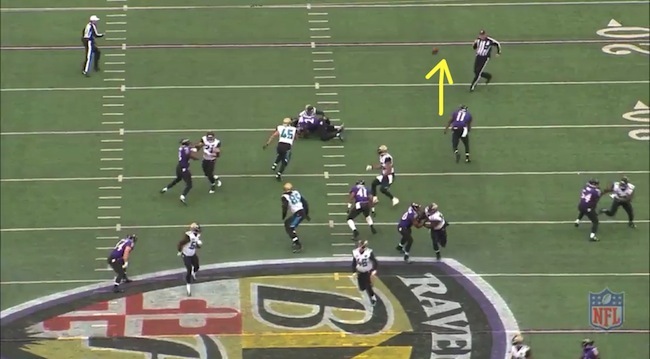 Near the top of the screen, Kamar Aiken (#11, indicated by the yellow arrow) has a clear path to the ball and the end zone. He scoops it up and takes a quick stroll in to put the Ravens up 7-0 early in the first quarter. 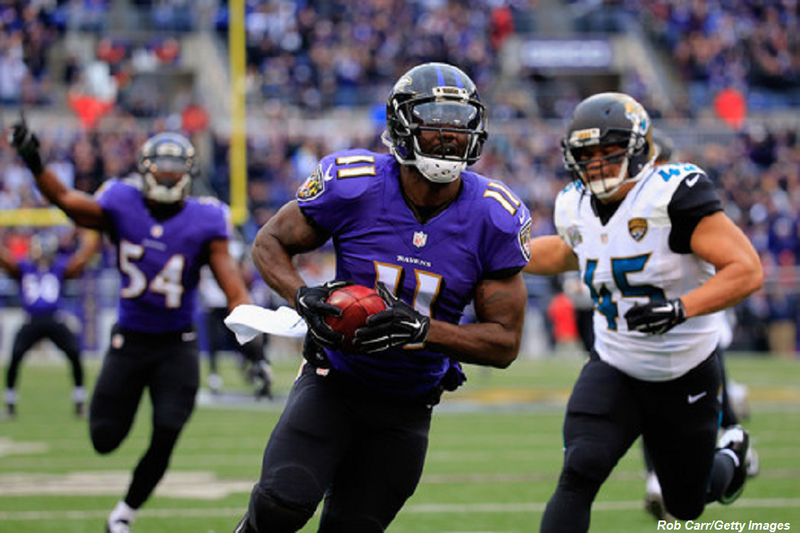 While the Jaguars pulled out all the stops on special teams later in the game to attempt a comeback, this proved too deep a hole to climb out of as they eventually lost 20-12 to the Ravens. 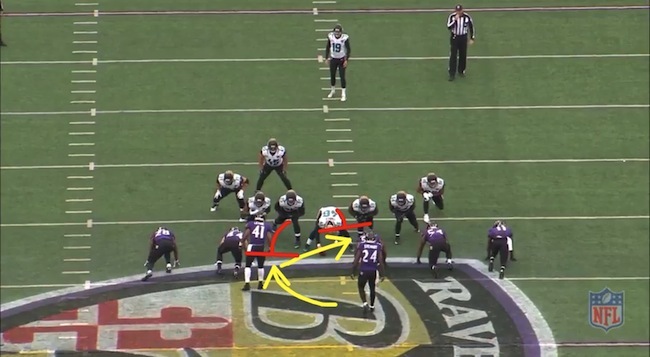 Baltimore’s design on this play proved simple, yet incredibly effective. It relied on a twist of two men at the line of scrimmage, with the close pressure drawing a lineman’s attention and pulling him out of position. 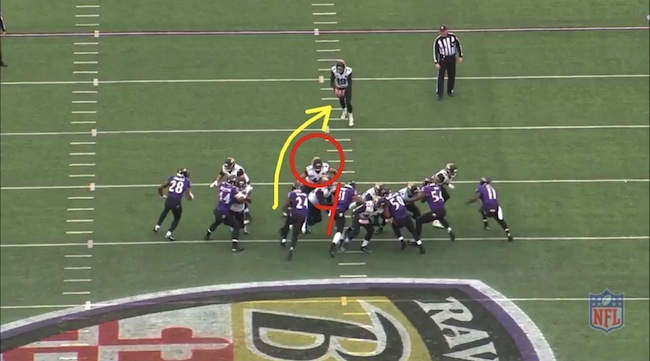 Rather than attempting to scheme for a large-scale misdirection, the Ravens focused on making one player fail his responsibilities, and, as we’ve seen many times this year, the results were catastrophic for the punt team.